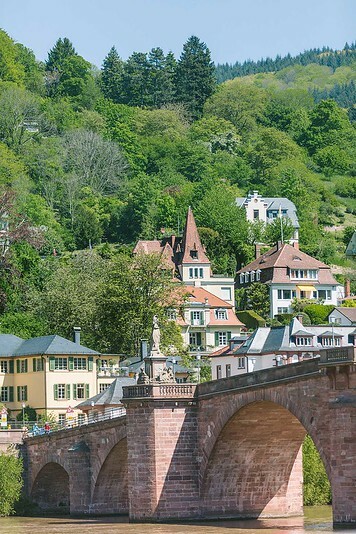 Recently, Viking River Cruises invited me to sail up the Rhine River and explore Switzerland, Germany, France and The Netherlands on their classic Rhine Getaway river cruise. The entire trip was calm and relaxing and I felt like it struck the perfect balance of sightseeing and leisure! I’ve taken many river cruises with family before and immediately knew my mom would love the smaller atmosphere, quaint towns and relaxing vibe, so I brought her along for the trip! I know river cruising is not for everyone so if you’re curious about Viking specifically or more generally wondering what there is to see and do along the Rhine River, I thought I’d recap our trip to show you the highlights. I would recommend this trip if you enjoy small colorful towns, World War II history and good food. We sailed from Basel, Switzerland up north on the Rhine River and ended at Amsterdam in the Netherlands. Viking also offers the same route in reverse, from Amsterdam to Basel so you can pick either. For a couple stops on the journey, boats running in opposite cities are docked together. We had a wonderful time and especially loved how organized the entire Viking journey was, from pre-departure to on-board, everything was seamless. Also unlike many other cruises or guided tours, almost everything was included, which made it feel like a truly relaxing vacation. Here’s a snapshot of our 7-day itinerary and what we got up to each day! We arrived in the small, quaint town of Basel after our international flight. This was the general arrival / travel date so we expected to just check in and relax but discovered that Viking organized a guided walking tour of the town. That was a nice surprise! There’s also the option to arrive a couple days early and/or stay a couple days late. If you are thinking of this, here’s a quick guide to the best hotels in Basel to help with accommodation. Basel is an underrated tourist attraction and the third largest city in Switzerland. 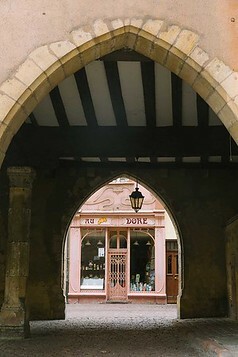 The town has a gorgeous Medieval center and plenty of world-class art museums. There’s a reason Art Basel is held here! We checked out the Romanesque cathedral, took endless pictures of the colorful medieval buildings and headed back to our ship to relax and meet everyone for cocktails and dinner. A great first day! 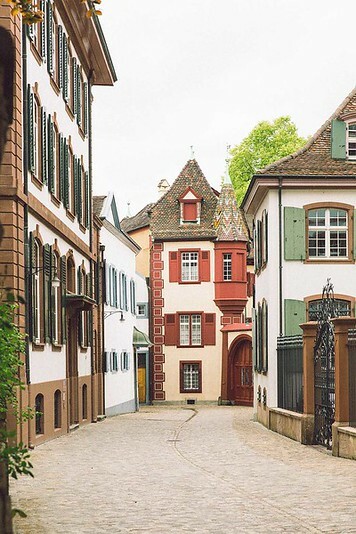 Read more: An Afternoon in Basel, Switzerland’s Most Underrated City! On our second day, we sailed northward to dock at Breisach, Germany. 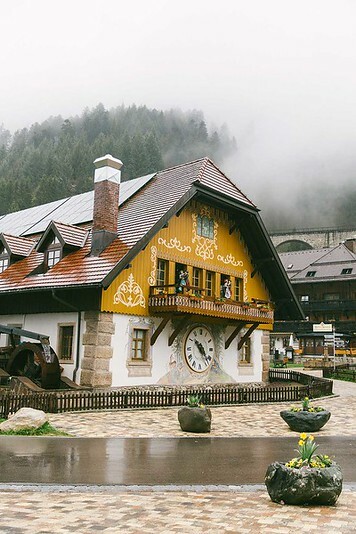 In the morning, we learned how to make cuckoo-clocks, put together Black Forest cake and walked a bit throughout the Black Forest. The wooded mountain range is the site of many local legends and populated all over with black fir trees. If you like hiking, the mountains are wonderful! In the afternoon, we signed up for an optional tour to Colmar. 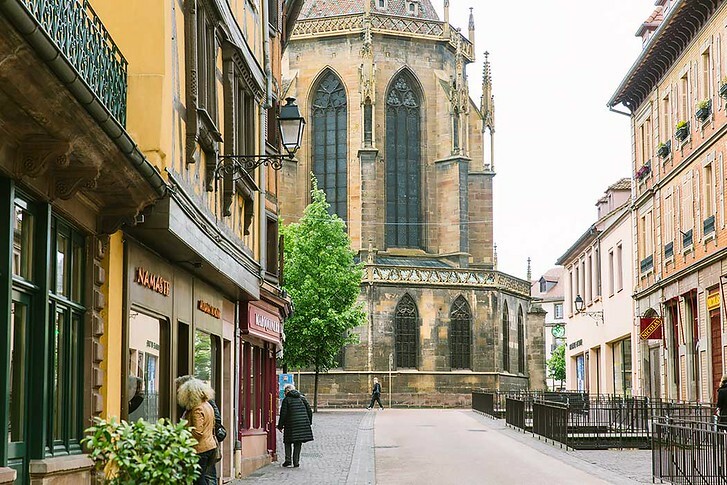 Located in the Alsace Lorraine region, the town is part of France but throughout much of history, changed hands between Germany and France. You’ll find lots of German and French spoken as a result! I highly recommend visiting this quaint medieval town. Every street looks perfectly preserved and it’s quite colorful. We wandered mostly on our own, ducking into gelato shops and chocolate stores while enjoying the colorful, medieval feel. If you skip the optional to Colmar, no worries! 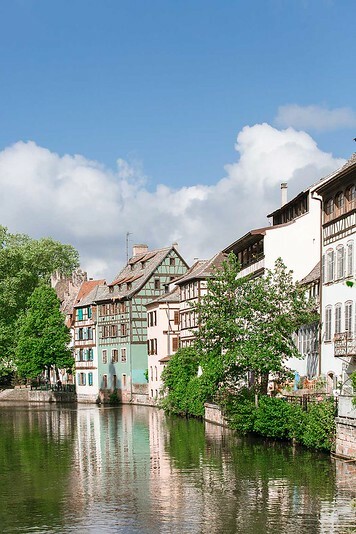 Strasbourg is its larger cousin and also located in Alsace, France. We had a wonderful guide for this day who guided us throughout the small canals, pointing out colorful streets and letting us know about Strasbourg’s tangled history in the hands of Germany and France. Strasbourg occupies a strategic position on the Rhine River and is the ninth largest city in France. It’s home to many European councils and organizations, like the European Court of Human Rights (a building built like a ship) and the Council of Europe. For the most part, we stuck to the Old Medieval Town but drove through the modern section. Highly recommend a visit to the Cathedral! 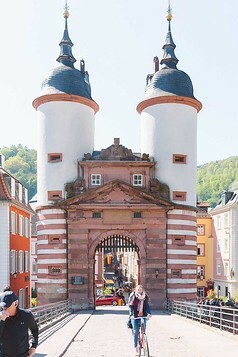 Heidelberg is a university town with a energetic, small town feel. In the morning, we visited Heidelberg Castle, which perhaps should be called a ruined fortress, as much of it was destroyed by lightening, fires and war. The ruins and castle are built high above the city and the observation terrace is well worth a look! Meanwhile, the city was almost entirely spared from bomb attacks during World War II and it’s narrow streets and baroque charm remain largely intact. 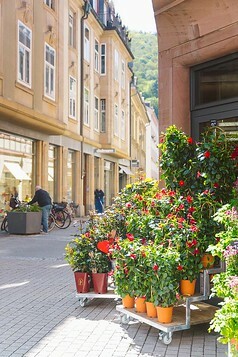 We explored Heidelberg’s Old Town (Altstadt) by walking along the main shopping street Hauptstrasse. This is actually the longest shopping street in Europe! For the most part, I spotted large chain stores & restaurants. I actually recommend skipping this street to explore the quaint alleyways and backstreets instead. Much more picturesque! By day 5, we had reached the middle Rhine and spent our morning above deck watching the gorgeous small German towns and castles along both sides of the Rhine River. Our Viking program director gave a guided tour along the way, pointing out castles left and right. Many of them are situated high above local towns and we saw lots of German camper vans parked at the base. I recommend bringing a pair of binoculars for this part, as some of the castles can be set a bit farther away and the detail through a zoom is incredible. By afternoon, we reached Koblenz, a city set at the mouth of two rivers. We explored Marksburg Castle and wandered a bit on our own after. This was another ruined fortress high above the river. Interesting history, but wear good shoes! The entire castle is unpaved, rocky and entirely uneven. A couple others from the cruise did the optional dinner excursion on this day and raved about it. 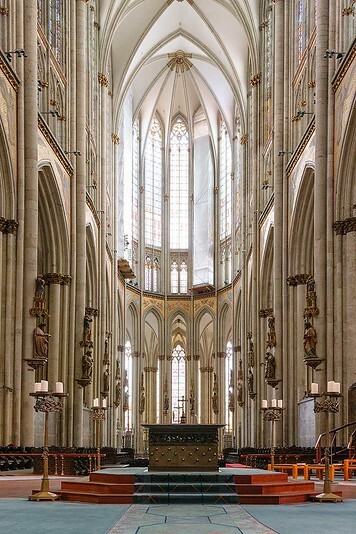 During the Holy Roman Empire, Cologne was the largest medieval town in Europe. Naturally, it’s Gothic cathedral is the hallmark draw! The nice thing about this stop is the ship can dock right into town, so you can join the tour or explore on your own. We explored the Kölner Dom’s interior and were suitably awed. If you want a great view, Viking offers an optional tour that takes you all the way to the very top! I had already been to Cologne on a previous trip so instead, we opted for a palace excursion. 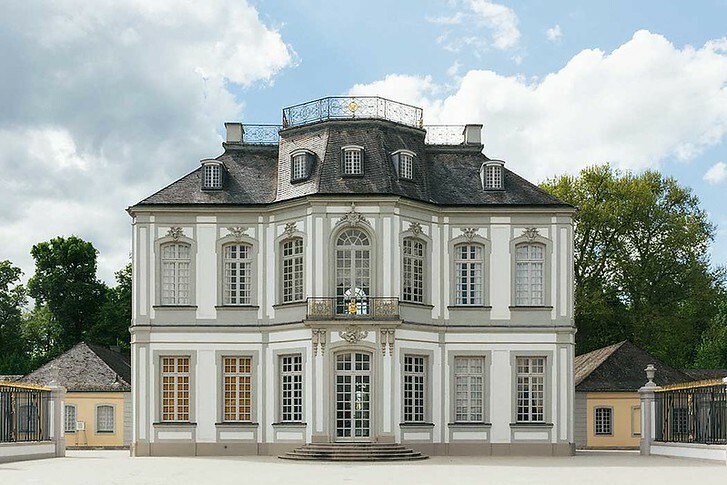 We visited Augustusburg Castle, one of two gorgeous UNESCO World Heritage site classified as Bruhl Palaces. The castle was once home to the prince-archbishops of Cologne and is decked out in gold, marble and all-around extravagance. I particularly liked the massive entryway staircase which was gilded and made my mouth drop open when we turned the corner. Highly recommend this day trip if you love castles half as much as I do! The interiors were really unique and the guided tour was excellent. After the main palace, we did a quick tour of the hunting lodge as well, which was just as stunning. Kinderdijk is home to the Netherlands’ famous windmills. I’ll admit I didn’t know too much about the country outside of Amsterdam and our guide was quite helpful to explain the history of the nation and the purpose of its many windmills. Much of the Netherlands would sink, were it not for windmills to pump away water. We even got to tour inside the home of a windmill keeper (see photos of a windmill interior here!). What I didn’t realize was that windmill caretakers actually lived inside them with their families! I thought the interiors were particularly interesting and our guide mentioned that some Dutch families managed to fit 13 children inside. They’re quite small so I noticed lots of hooks for hanging, curved bunk-bed type rooms and lots of stair ladders. The Dutch windmill keepers also had a number of really unique boats which I took too many pictures of! Fun fact: Kinderdijk is in the region of Holland in the nation of The Netherlands where the people speak Dutch. One thing I liked about sailing with Viking is how leisurely the day to day pace is. There’s generally an opportunity to sight see in the morning and afternoon, with one included tour and one optional tour. We chose to do 2 optionals and on the other days, relaxed on board or went into town to explore on our own! It was a well-balanced pace and I truly felt “on vacation”. Day 4 Morning: Explore Heidelberg’s Castle and Old Town. Day 7 See dutch windmills at Kinderdijk. Arrive in Amsterdam in late evening. Many of our stops were small European villages and medium sized cities, so we felt like we were able to see all the top sights without missing anything. The best part? enjoying the comfort of a luxurious ship without worrying about transportation from town to town and only unpacking once. I think most of us are familiar with large ocean liners that sail to the Caribbean. River cruises offer a very different experience – they’re much smaller ships, typically seating only 150-200 passengers. The Viking Hlin ship that I was on had about 150 passengers and approximately 60 crew members, if I recall correctly. In general rivers are much calmer than the open seas and you won’t have to worry about rough seasickness. We did a fun tour of the wheelhouse and learned from the Captain that Viking ships utilize four propellers instead of a traditional rudder. Because of this, they have the flexibility to turn each propeller a full 360 degrees for precision and smooth sailing so you shouldn’t experience any seasickness on board. River cruising is a much more intimate experience, with unreserved seating at meal times so you get to mix and mingle with almost everyone on board by the end (if you want!). There’s perhaps less on-board entertainment (no nightclubs or casinos on board) but each evening people congregated in the lounge by the bar and Viking had an on-board pianist. A couple nights during the week, Viking hosted either singers, dancers or local activities. My favorite was the glass blowing demonstration by a glass master from Germany! He was quite an artist and had different glassblowing techniques than what I saw when I went to Venice. The number one reason why I like river cruises so much is because you get to see many small towns and sights in a leisurely fashion. Depending on your journey, you stop in a new town every day or so and can get on and off the ship easily and on your own pace without queuing for hours! I wouldn’t say there’s a “best” European cruise per se, but there are a couple main rivers in Europe that offer river cruise experiences. The most popular are the Rhine River, the Elba and the Danube. The Rhine River runs from the Swiss Alps through the Franco-German border and empties into the North Sea up in the Netherlands. This is the route we took. The Elba River is a major Central European river and predominantly flows through Germany and the Czech Republic. A small bit flows through Austria and Poland. The Danube River is quite long, flowing through 10 countries through Central and Eastern Europe. It starts in Germany and flows along the borders of Austria, Slovakia, Hungary, Croatia, Serbia, Romania, Bulgaria, Moldova and Ukraine before emptying into the Black Sea. I did this route years ago with family and loved it because I felt like I saw so much of Eastern Europe in one go. Lots of quaint, small towns perfect for a quick afternoon visit! 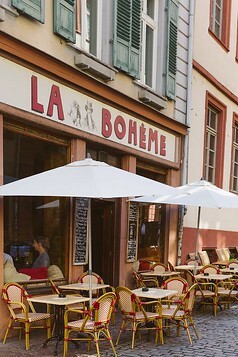 Our Rhine Getaway hit a couple towns throughout Switzerland, France, Germany and the Netherlands in one convenient week. Plus it had the added bonus of only unpacking once! 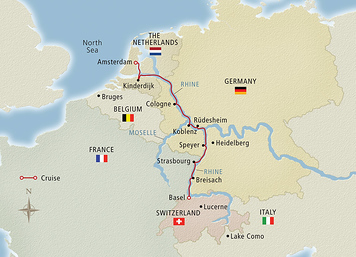 You can see the route we took in the Rhine River cruise map below. Once you book your Viking river cruise, the fun part is checking out the daily itinerary and browsing the optional excursions! I was really impressed with Viking’s interactive website called My Viking Journey. They have a handy map to show the journey along the Rhine River and make it easy to see what your options are each day. If you happen to pick an optional that conflicts with an included tour or a different optional tour, the website lets you know immediately. Viking also offers airfare, which I recommend as they have relationships with partner airlines and can usually find flights cheaper than you can do on your own! We set a fare alert and browsed for flights on our own, and after comparing it to the Viking customer service rep, found that they were able to get us a better deal. If you do end up booking your airfare through Viking, they also include round trip transfers, which we found quite handy after long travel days. Our bus picked us up in Basel and left straightaway, which we really appreciated. None of that waiting around for 50 passengers to get picked up! On our departure, we had a very early flight so they arranged a cab direct to the airport – everything is totally taken care of. We sailed aboard the Viking Hlin. All of Viking’s fleet are individually named after different Nordic Gods and Goddesses and while many of the river cruise ships are similar or even identical, the small touches and art are unique. Each ship has a giant painting of the Nordic god at the top of the main staircase, dedicated to the deity it’s named after. Having sailed on a couple other river cruises, I loved how distinctively luxurious the Viking ship and rooms were. 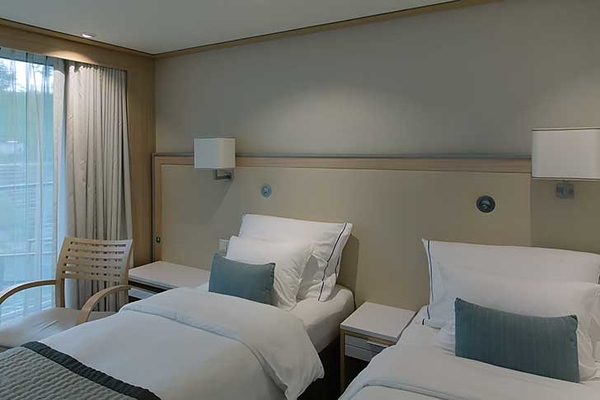 Our Veranda stateroom was spacious, bright and airy with minimalist Nordic furniture and a cozy balcony. The ships are well designed to really maximize space and cabins feature a giant closet and tons of drawers to put away your clothes, should you wish to fully unpack. Most river cruises are quite cozy and I typically keep my clothes in packing cubes… this was the first time I’ve fully unpacked! 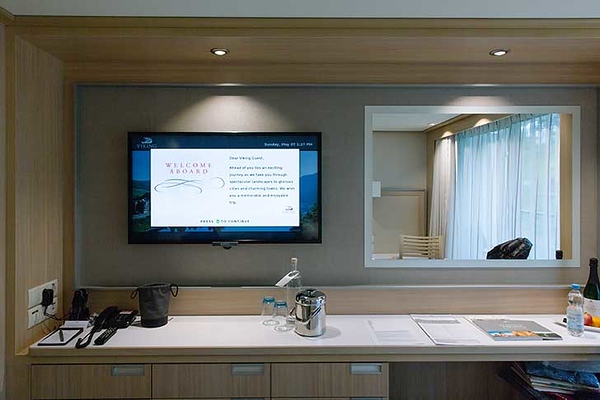 There’s also a flat screen TV to listen to the daily on-boarding speech (if you don’t want to leave the comfort of your room) or to check the weather, watch TV, etc. Our cabin had plenty of outlets, both European and American, so I could easily keep all my electronics charged. My favorite part of our floor was the coffee & espresso bar to grab pastries and java any time of day. I helped myself to endless madeleines and double dark chocolate muffins. Oh! I almost forgot to mention – Viking includes wifi on-board free of charge. I thought that was such a nice touch given that I’m addicted to my phone. Internet service is a slower than usual, as it’s satellite service on the river and therefore inherently slower. If you’ve cruised before you’ll appreciate this luxury! All other cruise lines charge exorbitant internet fees and still have slow service. Our room was kept immaculately clean and always stocked with fresh fruit and water, thanks to a diligent cleaning staff. I’m a bit of a germaphobe and really felt at home on board. The entire ship is airy and light-filled and despite it being a small river ship, it feels more spacious and open than some large cruise ships. Above on the sun deck, they even have a small herb garden to season meals freshly. In contrast, I once stayed on a ship where you had to step up into the bathroom and when the door was open, half the cabin space was used up – naturally, half the time I forgot the step existed and face planted. Viking cabins have a pocket door so that the cabins feel spacious with glass door showers and fully openable doors that tightly seal, so water doesn’t get everywhere. I did a cabin tour on my Instagram stories during the trip (@shershegoes) and got tons of messages that people were surprised how spacious and luxurious the cabins were! Viking also clearly pays attention to the small details – they design everything with care, from heated bathroom floors to angling the hallways to maximize cabin space… large-flip open toiletries that don’t leave you struggling to open them, high quality European fixtures and leather staircase railings… I could go on endlessly. It’s really clear on-board that Viking don’t skimp out on customer service and they all added up to make a seamless vacation! Each day, there’s an included guided walking tour. All the local guides were quite knowledgeable and Viking provides headsets so you can clearly hear. There’s even a designated group for those who wish to tour at a slower pace. What I really liked was that there’s no pressure to stay with the tour. You’re free to start with the tour and slip away if you find a restaurant you like or somewhere you want to linger (although it’s nice to let the guide know so they don’t wait for you). They really encourage you to make the most of your trip. 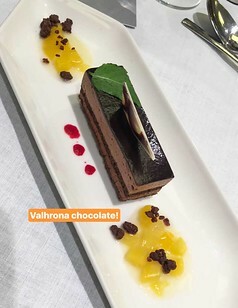 All three meals are included on-board and you have the choice to take meals either in the formal dining room or upstairs in the more casual Aquavit restaurant. We have nothing but great things to say about the meals! Outdoor or Indoor Options – If you like to socialize and want a formal 3-course menu dinner, try the formal dining room on the main floor. If you want more relaxed, casual food with perhaps a table for just 2, the Aquavit upstairs is a great alternative. We had lunch a couple times there and it’s quite nice to see the river views and sit outside. Local Cuisine – Viking also makes a effort to include local cuisine. One night we had an Austrian / German night, with local specialties like sauerkraut, sausages, pretzels, schnitzel and plenty of German beer. It was a themed night, where the dining room transformed into checkered tablecloths, the staff put on their lederhosen and mini kegs were emptied! All Inclusive – Wines are included during dinner times, which I personally haven’t seen on any other cruise! There’s also the option to purchase a Silver Spirits drink package if you wish to indulge in wine, beer and/or soft drinks before or after dinner. Planning a European river cruise? We can connect you with our Virtuoso travel adviser who gets clients phenomenal extra perks, including shipboard credits! And that’s it! Are you headed on a river cruise? Let me know if you have any questions about our Rhine Getaway with Viking River Cruises in the comments below. We opted to extend our stay in Europe after the cruise. Viking offers both pre and post extensions, which are a fun way to see more of Europe and combine the best of both worlds (guided group tours with individual trips). For our flights, we took advantage of Viking’s flight booking service. We set fare alerts and browsed for flights on our own, and after comparing it to the Viking customer service rep, found that they were able to get us a better deal. Be sure to get travel insurance for your river cruise. River cruises are highly dependent on local water levels, and abnormally low water can negatively impact your trip by forcing the boat to re-route. In recent years, the Elba river has occasionally suffered from extreme low water levels – perhaps due to global warming? In any case, don’t end up disappointed – travel insurance will help when you need it most. Get a quote for your trip here. 1 Day in Basel: Switzerland’s Most Underrated City! 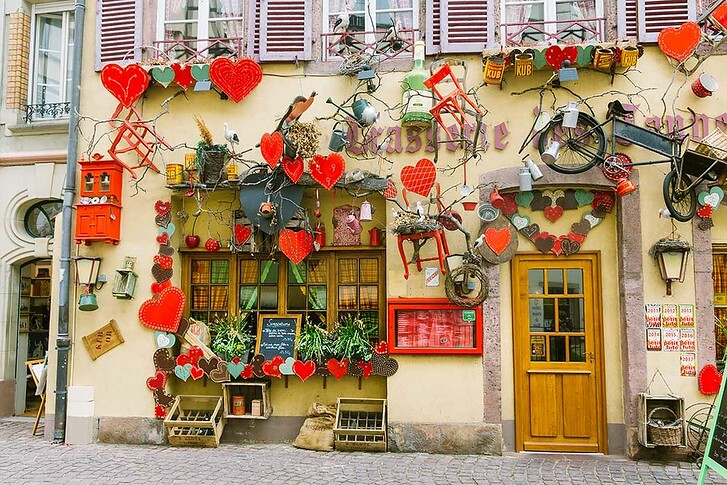 Colmar, France: Is this Beauty in the Beast Town Real? This looks so amazing. Your pictures are absolutely stunning. Such a great informative post. I have never been on a river cruise abroad. I am not sure that the tour that we did on the Ohio river would count as a cruise lol! I would like to visit here. All of your photos make me really want to plan a trip. Wow, amazing indeed! I have to add this to my bucket list of places to visit! Your pictures are Stunning!! The itinerary for this trip is near perfect. I think I’d enjoy every single thing planned. I especially like what’s scheduled on the third day. These photos make me want to head out on a cruise right now. I love the exotic feel of the settings in these photos and the breathtaking views. Someday I will get it together enough to visit. Strasbourg is definitely a highlight! Supposedly the university is fantastic and has affordable tuition, i might just apply! I was sooooooo excited to read your article! I have wanted to go on a Viking River Cruise for awhile now. Thanks so much for the helpful information. It was my first Viking River Cruise and I totally loved it (as you can tell from the post) Let me know if you have any questions and I hope you sail with them soon! This sounds much better than I expected! Some family members have been trying to get me to do one of these. Thanks for sharing! This was an excellent review! I’ve always wondered about Viking River Cruises and have strayed away from them because I just had never heard much about them. I love cruising on the big ships though, so I’m sure I would love a river cruise as well! Hey! Thank you so much for the detailed information about your cruise. I am actually headed on this cruise in a week and I’m very excited. Im obsessed with this blog! My fiancé and I are taking our honeymoon early and heading on the Rhine Getaway in 2 weeks. Is there and particular must dos in the other places where you don’t have the more thorough blog posts? Also do you have any more pictures of the verandah room, as that is the room type we will be in, and of the ship itself? What was the weather like? Are there specific things we should be packing as far as clothes or anything else? Hi Alyssa, ooh have fun! Hm I think Viking’s included tours do a great job of showing you the main highlights in each town, while giving you some free time to explore or have lunch in town if you wish. I did the optional tour to Augustusberg palace which I really enjoyed, its on the Cologne day. Just a gorgeous, unique palace and hunting lodge. There’s also an optional to see the top of Cologne’s cathedral which other people on the ship liked. And then one night there’s a fancy dinner in a palace – I didn’t sign up for it but almost regretted it bc it got rave reviews from those who did! I think its the same night as the German dinner night on board so whatever you pick you’ll have a fabulous dinner. Definitely recommend the Colmar optional, which I have the post about. If you havent been to Amsterdam before you might want to stay longer after. We went in early May and it rained a bit and was pretty cold. Viking has huge umbrellas, which was a nice touch bc I forgot to bring mine. Other than that nothing specific to pack – its pretty casual. It’s summer now so I’m sure the weather will be much better for you! You’ll love the rooms! I was so impressed with how comfortable they were given that its a river cruise and the ship is small. My pictures of our room didn’t come out so nice because my stuff was sprawled everywhere ha.. but we had a veranda room as well! Loved the balcony. All the bathrooms have heated floors which I loved and now want to install in my bathroom. I snuck a peek at the suites which have a separate living room area and look really really nice. I’ve also never seen a more diligent cleaning staff!! We sailed on the Hlin ship, which I think they said was 8 years old, but looked almost brand new to me. Viking takes amazing care of their river ships! I chatted to the staff one day and they spend the winter season breaking everything down, cleaning and doing engineering things to keep it in great shape. Oh! Do the roundhouse mini tour where you get to see the caption’s… office thing on the roof. He tells you how the ship steers and has some fun facts about the mechanics. I always find that kind of stuff interesting (how things work, how they became ships captain etc). If I remember correctly its something you can sign up for on one of the slow days when we’re cruising. Only if you’re interested, its not an official tour or anything! Can’t say enough great things about Viking and I’m already dreaming about doing another with them! But like the whole day how early could you get off the ship and how late could you start in port before you had to be back on? I can’t find that information anywhere. It depends on when the ship gets into town and if it’s departing for a different town that evening or docking overnight. Do you remember which ports you were docked at overnight? We did the Viking Paris to Normandy cruise in September of 2016. It was wonderful. We’re booking the Rhine Getaway today for September of next year. Thanks so much for all the helpful information!! Loved your post. I’m thinking of going next April. I have two questions: what are the temperatures like and is there a fitness or exercise room on board? It sound silly, but with all that eating I’ll want to do something to keep the weight off. Hi Bonnie – I went in mid May and it was still chilly..anywhere from 40-60 degrees. This year I remember being surprised, because we had a very late spring season so it’s hard to say what 2018 will be like! It rained a couple times in the first 2 days of the trip, and I forgot to pack my umbrella, but luckily Viking has some HUGE umbrellas on board for guests to borrow. I know for me personally, even though it can be colder I prefer traveling to Europe in April/May before the crowds hit. River cruise ships are small so there’s usually no room on board for a dedicated fitness room. That said on the roof of the ship, they have a track loop so some runners used that to their advantage. I think it was 13 laps on the roof deck equaled 1 mile and I only remember that because my mom kept up with her daily mile runs ha. On Viking’s ocean cruises, those ships are bigger and I believe Viking has both a fitness room and a pool on ocean routes. My name is Sunny Fletcher, I really enjoyed your write up and it was super inspiring! My boyfriend and I loved this particular itinerary but did not see it on the viking site when we searched for this particular 7 day cruise. Do you have any other cruise lines you could suggest? Also what is the predominate age group on these cruises. We are in our 40’s would we feel out of place? Thanks for your help. Hi Sunny! So glad you liked it. I would say you would be more in place than I was on the trip ha! Im in my 20s and went with my mom. The crowd has a good mix of age groups, predominantly 40+ to retirees and I would say Viking is a more active program than other river cruises. I do a lot of tours with my family so I guess I’m maybe more used to being the odd one out, but I don’t mind as long as the itinerary is good! Here is the cruise we took, it’s called their Rhine Getaway route. I heard that they also offer the same route during the holiday season, when Christmas markets are open so you might like that idea too. Enjoyed your piece on the Viking Rhine Getaway. We’re likely going to book it for May 2018. With both artificial hips, spine issues, etc., I don’t walk so well, or far, anymore. My wife is fine, can walk forever. With my cane I can do probably a mile before a rest. I’m wondering about the shore excursions, many of which are “walking tours”. Will I be able to do them? If not, what are the options? Hi Jerry! I think you would love the cruise and will try to provide my perspective. All the included excursions are walking tours but some cities involve a bus to get to the town first while other cities viking can dock right in town so the actual walking part is not necessarily that strenuous. Cities like Colmar and Basel have compact Old Towns so the walking is quite short, but Marksburg Castle was very uneven inside (lots of cobblestone old steps) that I even found that shaky. Regardless i would say that Viking is very accommodating. There was a man on our tour who was blind and used a cane and he did all of the walking tours. Sometimes the guide gave him a hand. For some towns, Viking offered bicycle tuk tuks or cabs to drive passengers right to the town center. I felt the tours were quite leisurely paced and if at any time you don’t want to continue, you can leave the group to explore at your own pace or do your own thing altogether. Many thanks for your reassuring reply. Most likely I’ll be fine. I wonder if Uber is available along the Rhine River route? A couple more questions. I’m trying to do a little research on flights in and out. We’ll probably book through Viking, but I’d like to see what the options are regarding connections, etc. Do you remember what the required times were to get aboard the ship, and to leave at the end? Should we plan to arrive a day before departure? Hm not sure about Uber. Lots of European countries ban it so I wouldn’t count on it, but there are regular cabs and the bike tuk tuks. Plus viking’s bus coaches. You can arrive early or stay later but I flew in the day of departure. If I remember right, the boat sets sail in early evening so arriving the day of in the morning is fine. If you want to explore more of town, then I would stay extra. We did the Basel > Amsterdam route. Basel is very small and I felt like we saw enough on the day of. If you arrive in the AM, Viking is nice and provides a complimentary informal walking tour of the old town! Lots of people extended their stay in Amsterdam since you don’f actually see that city during the itinerary. I don’t remember the exact time you should leave, because we flew to Copenhagen on a very early flight. I think maybe they ask you to leave by early afternoon? So they have time to clean the boat before the next sailing route. Hope that helps! Hi,I have taken two Viking trips, the Danube Waltz two years ago and the Balzel to Amsterdam last year, I can’t say enough about how wonderful the trips themselves were, however, the air fair provided was another story. I understand it is offered free, BUT, when you are stuck in the last row in the plane, get told this is the only food option that is left and sorry there is NO WATER AVAILABLE, it made for a very long ride home from France with a man in front of us who had definitely not showered in a while. Nice read. Quick question what is Vikings policy to bringing your own alcohol drinks on board. It sounds like it would be nice to sit on the room balcony with a bottle of wine. HELLO, we are taking the Rhine River cruise in late Oct. I know no one can accurately forecast the weather,wondering what kind of jacket/coat should I pack. Also, will the christmas markets be open? Hi Lynda, I would think it’d be pretty cold. Usually October in central Europe is ~50s during the day and as low as ~40s around night time. I would probably pack jeans/long pants, light sweaters and either a wool coat like this http://bit.ly/2vz4X6w or if you’re wearing layers, a windbreaker like this one: http://bit.ly/2wz0plj. Unfortunately the Christmas markets don’t open until late November but I would think October would be a beautiful time to see fall folliage along the river? Autumn is my favorite season so I’m sure it will be even more magical in Europe. Have a great trip! Thanks for the great review. I’m taking this trip in April 2018 but in reverse. This answered many of my questions. Thanks for all the great details. I can’t wait. Lots of helpful info there! Someone just told me that she had been on 3 river cruises — I think all Viking — and that you had to leave the ship around 7:30 a.m. if you wanted to join the walking tour. I’ve never heard anyone else mention such an early start. Did you experience this on your trip? Hm.. I think I got up by 7:30am but I don’t think we left the ship quite that early. I want to stay it was about ~7:30am breakfast, leave by 8:30-9am. There are generally 2 time slots for tours per day, one in the morning and one after lunch – you can do both or just do one. Usually everyone does the morning one and if you book an optional tour, that would be your afternoon option. FTo be honest, every land group tour that I’ve been on and when I travel personally, I get up very early to see as much as possible so I felt like Viking was nice and a “slower pace”. One lady at dinner mentioned she thought the times were early for her, so I guess it depends on your personal travel style! Once you book a tour, Viking has a section of their website called “my viking journey” where you can see the optional tours offered and it makes it very easy to see the tour times so that you don’t double book yourself. Hope that helps! If the intinerary shows a tour for morning or morning and afternoon does that mean they leave after the tour or do they stay till evening so you can mull around? Hi Margie – it depends! If the ship is staying in town and not sailing onward, you can stay out on your own after the tour, have lunch in town instead of on the ship, wander etc. For example, I think in Strasbourg some of us did this. Also in Cologne we docked overnight so you could hang out all night until the early AM if you wanted! If you decide you’ve seen enough when the tour ends, then you can take advantage of the included shuttle bus to take you back to the ship. Sometimes, the ship sails onward or if it’s an optional tour it might be a town far away from the dock, so it’s expected that you’ll go with the group. For example, the Colmar optional tour which I took takes you to Colmar (which is not close to the dock) so you wouldn’t want to linger. Hope that helps! Hi Melissa! Ha yes the unpacking part and luxurious room were too good to pass up. Hm.. it’s definitely an older crowd, most people in their late 40s – 50s if I had to guess their ages. Some retirees as well. But, I do lots of group tours with my family and I would say its more of the “active” older / retired crowd vs those who just like to be shuttled from place to place. There were some 30 something couples on board and at dinner you can either eat solo or mingle, so it just depends on what you prefer. If you prefer a really social atmosphere, European hostels are the best bet or I’ve had friends who went solo and joined something like a G Adventures tour for the social atmosphere. Would you be going solo? Because cabins are usually meant for 2 people, river cruises in general tend to charge a single supplement fee (I think Viking does, but I’m not certain). Sher, My husband and I are traveling next June on Viking River Cruise Paris to Swiss Alps. I was wondering if you would suggest we bring binoculars and a camera with a zoom lens to see and get good pics from the river itself. Also wondering if you know how flexible they are regarding problems clients have with food issues? I was glad to hear that if the pace of the tour was too fast or slow that you could break away from the group, however are cabs fairly easy to find if you find yourself needing to return to the boat? Do you suggest a particular app for your phone to translate? Also wondering about carrying cash or credit cards for excursions, should we have both or did you find one better than the other? Thanks I know that’s a lot of questions! Ooh Paris! Sounds like a good itinerary. 1) I’m a bit of a photo fanatic so I was very glad I brought my zoom lens. I think my mom would have appreciated binoculars, especially since she has poor vision. You can definitely see the castles from the naked eye on the boat, but if you want to see detail binoculars are helpful. Did you check out my German castles post? All those photos were shot with a 70-200mm lens (mostly at the 200mm mark) so as an example, you won’t see the individual castle windows or small town churches like in those photos without a zoom or binoculars. I mentioned it in the post because I didn’t bring binoculars on a safari trip to Africa and while I could see the animals just fine, a kind man lent me his for a day and it was such a better view! ha. So just personal preference. 2. Hm, I don’t personally have any dietary restrictions so I’m not sure. For dinner, there are always several options to choose from, including a vegetarian one. I *think* they have options for gluten free but I’m not 100% sure – you can try using the chat bot on the viking website or calling a customer service rep to make sure. The waiters and all the staff are exceptionally friendly / helpful and can make menu substitutions if you don’t like anything or are allergic. I remember they had ipads during dinner service to jot notes & things. They also have excellent memories! If you wanted two appetizers or ahem, two desserts (like I sometimes did), they’re very generous with that, it’s not an issue. 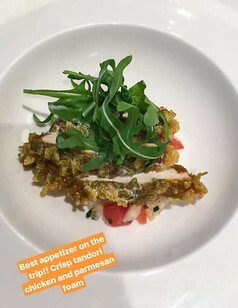 Or if you wanted appetizers instead of mains, that sort of thing is easy for them to accommodate. Usually at the front desk, they will have maps of the city so ask for one of those before you disembark and if you want to explore on your own, then you can use the map. Also a tip is to download the offline Google Maps for each city you’ll be visiting. I always do that before I travel! I’m a big walker so with the offline map downloaded, you can navigate yourself back to the main square or the dock. And of course if you get cell service using something like Know Roaming (which I’ve reviewed on my blog briefly here) then you can get cell service too for emergencies. Viking uses these headphone systems which are pretty good and they split the passengers into smaller groups, so if you see yourself wanting to explore more of the city just let the guide know you’re leaving the group and you can find out about local cabs or meeting points, etc. Every evening, they leave a pamphlet in your cabin so you can get a sense of what you’ll be visiting the next day. 5. I rarely bring cash to be honest, I bring a couple credit cards which carry no foreign fees and I bring my debit card for the atm / emergencies. I’m also not a shopper / I don’t buy souvenirs anymore but if you like to shop, cash is helpful for small things like street fairs, flea markets, christmas market stalls, food stalls. Do you have Chase bank? You can call ahead and ask your local branch, mine in NYC can exchange euros same day, so if you want to bring like 100 – 200 euro just to be safe, you can try that. I’m sure other banks do it too. For the optional tours, I would recommend booking those in advance. Some of the popular ones fill up. If you login to the “My Viking Journey” website it will show you, day by day, which tours are available and also will warn you if you’re booking overlapping tours or things that conflict. I found it quite handy! So since you book those ahead, you book them all on credit card. In general I prefer credit cards because I get points and I find carrying cash /dealing with change a pain. But that’s just me! Hope that helps – feel free to reach out if you have more questions. I enjoyed your account of the river cruise and I’m curious as to how dressy or casual folks were. Do you have a packing list for this trip? Hi Penny! Glad you liked the article. People were pretty casual (pants, jeans, cold weather jackets etc) but I also went in May when the weather was still pretty chilly. For dinner time, I believe they ask for closed toe shoes and no shorts, but there isn’t a requirement for jackets so it’s no where near formal. I haven’t written a packing guide yet but have gotten a couple requests so I’ll add that to my list of posts to write! We either went back into town, had drinks in the lounge or stayed in to watch Downton Abbey (LOL). It’s generally pretty quiet at night since it’s a small ship vs. huge ocean liners. We also loved our river cruise! We left from Amsterdam in August and finished in Budapest with the optional trip to Prague. One word of caution, while the glassblower’s demonstration was awesome, he has yet to send us any of the items we ordered and paid for. He said it would be 3 weeks…it is now about 5 months. After multiple emails to him (unanswered) and emails and phone calls to Viking we are giving up and disputing the charges on our card. I’ve seen other complaints on trip forums about him. I’m disappointed Viking still brings him on board! Hi Nancy – glad to hear you liked the cruise as well! Wow, I had no idea about the glassblower. I’m wondering if it’s the same glassblower since the one on our trip didn’t have large items to ship, he brought lots of little items (candle holders, ornaments, figurines, vases, etc) that you purchased right there, they packaged up for you and then you took it with you right away. I got one of the glass ornaments and hung it on my tree this past Christmas! I’m so shocked to hear the glassblower you had didn’t ship promptly. Have you reached out to Viking customer service to file a claim and let them know? That’s very disappointing and you should dispute the charge if it’s been 5+ months and no package. Credit card companies are usually great about resolving that in your favor. home with us. The problem is with what we ordered. We ordered 2 ornaments that were to have names etched in them along with the year. We also ordered a set of his Jagermeister shot glasses for our son with his monogram etched on them. Our friends also ordered his salad dressing bottles. They also have received nothing. We have contacted Viking several times. They said they’d look into it but nothing happened. The last time they were the ones to say to dispute the claim. It’s disappointing that Viking does not seem to care that much. It makes us wonder if they get some kind of a kickback from the glassblower. I just google searched his name and photos of him came up. He’s not the same glassblower who was on my river cruise (Viking has so many ships I’m sure they have many, many glassblowers that they partner with). Viking probably does get a kickback. Pretty much every travel company or tour builds in visits to local businesses and in return they get a % of commissions, just like a shoe salesman at any dept store. If you ever go on a Chinese tour – man, those take the cake for how many shopping visits they can pack in, all because they get a commission! Same with hotel concierges – they usually recommend restaurants they get a kickback from. such is life! It’s really unfortunate that you haven’t received the items and that he essentially stole your money. If you paid via credit card, you should definitely get your money back. In my experience, American credit card companies (is yours american?) have fantastic customer service and you can file a dispute online very easily. We’re considering this same cruise (from Basel to Amsterdam). Curious to know, are there better views on one side of the ship than the other? We were thinking of getting a french balcony versus the veranda. Which did you have? Hi Dawn! We didn’t feel like there were better views on one side or the other. Hm, I can’t remember the name of our room but we had a small narrow balcony with 2 chairs and a side table where we could drink coffee outside. It was nice to get fresh air and we sat on it once or twice during sailings. We also peeked into some suites and those looked HUGE! I think the standard rooms are fine, since you don’t spend all that much inside. Hi! My mom and I are thinking going on the same Vikings tour as you and your mom, but we are doing the reverse route. :) It’s nice to see that some other young people go as well! My question for you is that my mom will be 74 by the time we take this cruise. She can’t walk very long distances without needing to sit and rest for a couple of minutes. Bad knees and back. It seems like your excursions had a lot of walking involved. Do you think, in your experience, she will have issues with the walking tours that are provided by Viking? Hi Sarah – sounds fun! I think she could do it. There’s 1 walking tour per day in each city / stop. The walking tours are about 1 hour, give or take, but if you get tired or want to leave, there’s no problem with ditching the tour to go stop at a cafe or go shopping. The tours are optional too, so if you and your mom would prefer you can always just leave the ship on your own and come back when you wish, instead of doing the tour. It depends on the stop (sometimes the boat isn’t docked in the center of town so it’d be difficult in those instances, it just depends on the river / boat area). 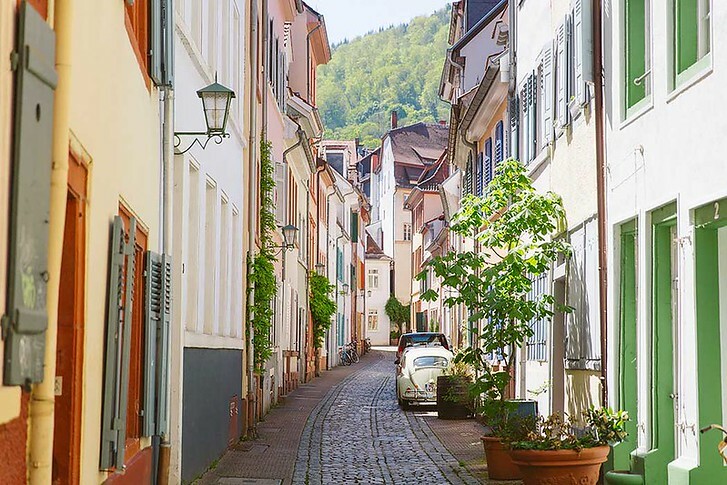 From the top of my head – the Black Forest is very doable, Colmar is a very small town so we booked the optional tour but explored on our own, the windmills are within walking distance from the boat and you can go at your own pace. Cologne we docked right in town. I wouldn’t recommend Marksburg castle because it’s very old and entirely uneven cobblestones. The Viking staff can help you arrange a taxi or bike peddler if you want to go into town in more comfort or come back early. Overall I felt like the cruise was very relaxing. Hope that helps! Hi Sarah – One thing I forgot to mention in my comment. Each day for the included walking tours, there is a designated group for those who want to explore at a slower pace. I didn’t join those groups so I’m not sure exactly how they work but thought that group could be great for your mom! Considering this same cruise in 2019. Is there a bar on the ship to have a drink after dinner? Does Viking allow you to bring your own liquor on board? Hi Diana – yes there is a nice bar and big lounge area. If you buy your own bottle of wine or spirits in the town, you can definitely bring it on board. I saw people drinking on their balcony. I’m not sure if you can bring your own liquor to the bar area though. Loved the article. We just booked a Danube cruise so I’m excited and this is really helpful information. I can’t wait. It all sounds wonderful. Thank you so much for your detailed comments from your Viking Riverboat Cruise on the Rhine. My husband and I are taking the same trip in June 2018 and were extremely impressed by your suggestions. It was wonderful reading about someone else’s experiences and recommendations. Your photography is oustanding. We are looking forward to our trip even more thanks to you! Hi thanks for all the info in your blog….sounds like we have signed up for the right cruise. 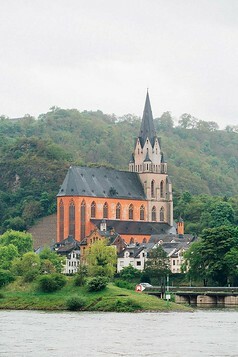 We are taking the Rhine Getaway in July as a 70th birthday celebration for my husband. We are landing in Basel a couple days early and planned to take a train for a day trip to Lucerne (about an hour ride). Wondering if you have any thoughts about things to see/do in Lucerne? We also extended a couple days in Amsterdam…any specific must sees (we were thinking of the hop on and off bus or canal boat give us flavor of city and an easy way to get around), and know we want to see the Ice Bar. Thanks again for all you info!!! Wow sounds like a great birthday celebration! Lucerne is very pretty, we just took it easy and walked around. I have a post on day trips from Amsterdam here. The city itself is very popular, a bit crowded, so try to go early for things like the Anne Frank Museum. Try a canal cruise too! Since you have more time, I really liked visiting the Hague and Bruges. The Hague has some stunning buildings like the International Court of Justice while Bruges is more small town / medieval, very picturesque. Have a great trip! Quite a thorough review. Many of our questions were answered. We’ve not been to Germany before so we are curious and deciding between this river cruise or a land tour. It does sound like this would be a great first-time visit to upper Europe (We have been to Rome, Athens & Crete). I really would like to see the Alps too. We’d like to also see Lucerne(Cogwheel Train, Gondola) and Munich. Hello, Thank-You for ALL the tips on River Cruising. My 89-year-old mother and myself are planning a 2019 Paris and the heart of Normandy in Early April. any recommendations or comments on that trip? Great summary of the trip. We’re going on the Rhine cruise in November and can’t wait. Leaving from Miami to Basel. We’ve been in many cruises in large ships but this one will be a treat. Decided to go business class with Lufthansa and that will also be a treat. Thanks! Hi John – glad you liked my recap! Ooh, business class on Lufthansa will be such a treat. Have a great time – I think you will like the more intimate atmosphere on a river cruise! Planning a 25th Anniversary trip for my wife in 2020. Really enjoyed reading about your experiences. Not sure yet what trip we want to take, but you make a great argument for the trip you described in this Rhine Getaway river cruise. Hi Sandra – it’s up to you! Most of the guided tours take place in the morning (you’ll get a schedule the night before in your room), so you can decide what you’d like to do each day. I would suggest trying out 1 or 2 of the included free walking tours since you can always leave the group to go back to the ship or explore on your own if you no longer want to participate. Viking is very flexible and their tour guides are OK if you decide to leave mid-tour. Just let them know so they don’t include you in the headcount. Yes, I would definitely suggest you skip Marksburg. The castle is in ruins and the footpaths are cobblestone – very uneven, very challenging for unsteady walkers. Heidelberg Castle is on a hill, but it’s much flatter and easier to walk, so it’s up to you. You can wear whatever you want to dinner, Viking is pretty casual! Jeans are fine. Hope that helps! Hi – great article, comprehensive & thoughtful! Wondering what time of year you went on the Viking river cruise? Hi Kathy – I went in spring, at the beginning of the season! Thank you for all the great information. We will be doing the same trip the first week of November and it’s so nice to hear we made a great decision! Hi there! We’re on our final day of the Romantic Danube Viking River cruise. I agree with everything you’ve stated. Great ship, staff, food, and itinerary. Water levels are a huge deal, though. We’re presently completing a 3 hour bus transfer from Vienna to Budapest – missing one of the most scenic parts of the cruise. We are making our 2nd ship swap for the final night / our 3rd ship. We received an email from Viking one week prior to departure telling us about the issue between Passau & Krems. Tuesday night our program director informed us of the additional issues past Vienna. We cruised the scenic Wachau valley after dark. So we missed 2 of the 3 primary cruising segments. Spent 6-7 hours on buses – very nice buses- but buses. We realize Viking can not control water levels, but their communication was late & misleading. They’ve been doing this for months – maybe years, yet acted like it was out of the ordinary. Passenger morale was affected. I’m not sure if they’ll offer vouchers. Some passengers were very upset. Nothing about this on their website – apart from the fine print – but cruisers are blogging actively about this issue. Hi Scott – Wow, yikes! So sorry to hear that your cruise had an issue. I hadn’t known about the water levels issue as our cruise was on the Rhine River, and to my knowledge, the Rhine River hasn’t had any critically low water levels. I’m not an expert by any means though. I sympathize with you since it’s a terrible situation all around. Viking cant control the water, but naturally you didn’t have the full experience. It’s good that Viking had a back up plan so you could still at least experience the cities on the itinerary. Has customer service gotten back to you about vouchers or anything else they can offer? Also, just curious – when they emailed you a week before departure, were you able to cancel the cruise and opt for a later date? We river cruised on emerald last year,sounds very comparable to Viking. They did include wine or beer with lunch and the 5 course dinner. You mentioned wine with dinner. Does Viking also include included wine and beer with lunch? . Viking is maybe more catered to Americans (ie: flight prices transatlantic). We are trying to find the best river cruise from Amsterdam to Basel,Switzerland, and this trip you took sounds wonderful. I do recommend you try out Emerald,they are fantastic. What would be comparable to a cabin with a “balcony” ? Ie: a window that rolls all the way down? These answers will possibly help us to decide. Thanks so much. Hi Maria – I hadn’t heard of Emerald before, thanks for bringing them to my attention! I just looked them up and they seem to have very similar luxury river cruises. It seems like they are an Australian company? You’re right that Viking has a big American market. I believe the owner / company ethos is Scandinavian but they seem to focus on the American market as there were lots of American travelers on our journey. I’m not sure what you mean by “what would be comparable to a cabin with a balcony”. Are you asking about accommodation on Viking? All the rooms are quite nice, the more expensive rooms get you more a bigger floorplan, higher floor and potentially a small outdoor balcony. For us, we had a small outdoor area – not too big, just enough to fit a small table and chairs and have a glass of wine or morning coffee. Hope that helps! Or do you mean what are the rooms like without a balcony? If you go to Viking’s website here and scroll down, they have a floorplan of the Europe river ships and each room. There’s also pictures of the standard / french balcony and veranda rooms. Hope that helps! Hi Sher – My wife and I will be going on our first cruise ever in September 2019 on the Amsterdam to Basel run, with an extra few days in Basel. I had booked a couple months ago and splurged on the two room Veranda suite. We’re very much looking forward to the trip but was curious if our suite is worth the cost. Will we find that we spend very little time there anyway? Thanks for your great website. Hi Doug – ooh fancy! We haven’t personally stayed in the suites before, but we’ve gotten a peak into the rooms and they look super spacious and very nice. We definitely spend a lot more time in our rooms on river cruises vs. ocean cruises, as there’s not as much on board entertainment. Also if the weather is great, it’s very nice to sit on the balcony with a glass of wine during sailings and typically September is beautiful in Europe! Hi Karen – Hm.. November might be a bit cold. I think May to October might be more comfortable weather wise! I enjoyed this blog so much, we were thinking of doing a cruise, but now you have convinced me. Excellent writing, informative , and your photos are wonderful. One question, my husband enjoys a good cigar and drink, is there a designated smoking section with a view or just an area for smoking? PS just started following you on Instagram!! Is their drinks package worth the price? Hi Peter – it depends on how much you like to drink ;) Viking includes house wine with lunch and dinner. If you want other drinks, or perhaps cocktails after dinner, then I would say it’s worth getting. If you are fine with wine during meals, then don’t bother! One of the best written river cruise reviews I’ve ever read. Sher, you have a great style in presenting activities as well as the cruise experience. Wondering how well the cruise would be for me as I am oxygen 24 hrs….Also is there much climbing involved? Hi Cliff – The ship has an elevator on board that you can use. For the excursions, there wasn’t any climbing but the tour of Marksburg Castle had VERY uneven paths (broken stones) so I’d probably recommend skipping that. Hi great information, was wondering when do you think is the best time of month to do this cruise? I was thinking March or October, any thoughts? 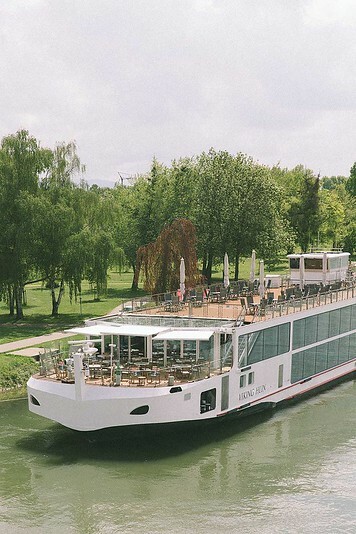 Hi Suzanne – the European river cruise season starts in May. Usually the clean the ships in the winter and do maintenance, upkeep etc, so I don’t think March sailings for the Rhine river are available. I could be wrong! I also think it would be too cold in March to enjoy. October would be nice! I haven’t done any fall sailings but I think it would be much less crowded and perhaps the leaves would change. Plus there’s Oktoberfest in Germany in October! We are doing our first Viking cruise in October 2019. Amsterdam to Basel. We are arriving from Philadelphia. We do not have the pre or post add on days, but do want to see the Anne Frank house in Amsterdam. Do you think we will have time? Also, I was interested in the added excursion to the top of one of the cathedrals and was under the impression there was an elevator, however, also saw where you had to climb over 300 steps! I have found your website to be very informative. Hi Donna, thanks! Hm.. I’m not sure if you have time for the Anne Frank house. On the last day of the cruise, you’re expected to leave the ship quite early (I believe before noon), but if your flight is that evening, you may have time. Make sure to book your tickets online before your trip, you can do that on their official website. It’s one of the THE most popular attractions in Amsterdam so expect really long lines. Or, you can take a walking tour that covers the history of Ann Frank, these are pretty popular. Regarding the cathedral.. I assume you mean the Cologne one? It’s been a long time since I went to the top (I went before the Viking trip) so I don’t quite remember. I believe there is no lift, as it’s a very historic, old church. But you can double check with Viking before booking their excursion! 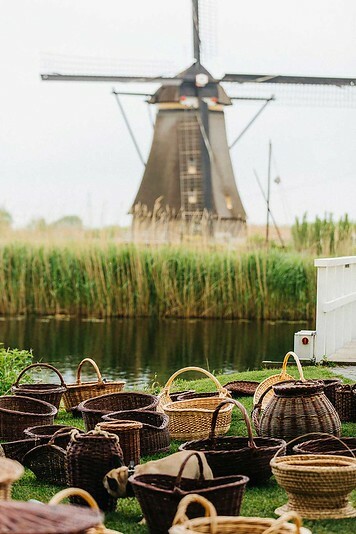 We are planning our trip on Viking River Cruises from Amsterdam to Basil in mid May, and I”m trying to figure out what and how much to pack. I see that the weather is quite changeable, rainy, cool to moderate. Are there laundry services on board the ship (Viking Einar) or facilities for guest to go their own laundry? Hi Deborah, Yes if I remember correctly there’s laundry service on board. Sher – my sister’s and some girlfriends of ours are planning our 1st ever international trip for our 50th bdays (gulp, can’t believe we will be 50!). As most of us have never been overseas and an international trip is a “once in a lifetime” opportunity for us, we need a trip that is easy to navigate for newbies and gets us the most bang for our buck (see all we can). I have several questions for you: Did Viking pay for you to take this trip? Do you think the Rhine Getaway would be a good choice for this group based on my description above? Is there any “night life” for the evenings (we don’t want to be in large touristy areas but do want to experience as much as possible)? We don’t want to go during peak season or the worst weather time. Would April be a good time to go? Many of us either have German and/or Irish heritage so we were wanting to fly to Ireland at the end of the cruise. Is that possible? I’m sure I will have a ton more questions so please let me know how best to communicate with you. Thank you so much for your post. It was very helpful. No – Viking did not pay me to take the trip (but that would be the dream). I did receive the Rhine cruise complimentary, along with several other journalists, in exchange for taking photos and showcasing the cruise on my Instagram account. I ended up loving the trip so much that I decided to write a more in-depth review on my website. They had no control or input in what I wrote – the article is entirely my own opinions. 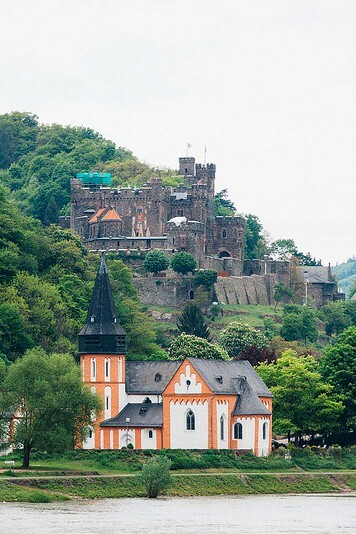 Should you take the Rhine Getaway for your group trip? I think it depends. If you are looking to celebrate with a bang, then no Viking probably isn’t the trip. At least, not their river cruises. The river cruise ships are intimate (maybe 100+ passengers) and there isn’t much in the way of entertainment at night. No casino, no pool, no shows, dancing etc. There is a pianist on board, a roomy lounge and a great bar, but that’s about it. The ocean cruises (which I have not been on) are much larger ships with entertainment on board. You can go out at night off the ship if the boat is docked. It depends on the city though. Some cities have their docks right in the town center, like Cologne, so you could stay out all night until the ship leaves the next morning. Other cities, like Paris, the docks are about 30-45 min driving outside Paris proper, so it’s less convenient. Viking will organize shuttles for you to go into a nearby town, but if you wanted to go out at night into Paris, you would have to take your own taxi. For places like Rome, forget it – its like a 2 hour drive. It just depends on the city’s port logistics. If you are ok with a more cultural, relaxing trip then Viking would be good. And then you can fly to Ireland after and party :) Dublin is a great city for that, and all over Ireland, the pubs are fantastic, the people are so friendly, it’s a great country to have a good time in! The river cruise season kicks off in mid May, so April is a bit too early. Try late May or early June, or maybe mid September – mid October, to avoid crowds + have great weather. 1) Strasbourg – should we take the optional Strasbourg from the Top? Or stick to the included Strasbourg Highlights? 2) Heidelberg – we are doing the 6 hr included tour in the morning. 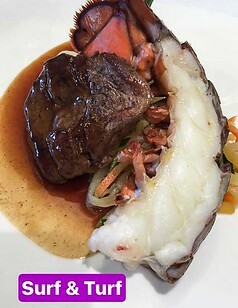 We thought it would be fun to do the Dine in City Rudesheim that evening for $158 total. Is that worth it??? Many thanks! Have enjoyed and learned so much reading your review and insights. Hm, I stuck to the included Strasbourg tour and thought it was a good half day tour. We had free time after to explore the city. If you like a good view, maybe the optional is good? I don’t think there is an elevator for the cathedral though – its stairs. Up to you! For your second question, I just double checked the Viking website because I can’t remember the specifics. They list the Rudesheim am Rhein optional on the Koblenz Day, not the Heidelberg day. That’s the add-on dinner you’re referring to right? But under the Heidelberg day, I wrote we went to Rudesheim that night on our own so I think you are right about it being the Heidelberg day. If I remember correctly, the boat docks in Rudesheim, so you can go into town on your own and choose a restaurant if you want. I don’t think the optional is necessary. 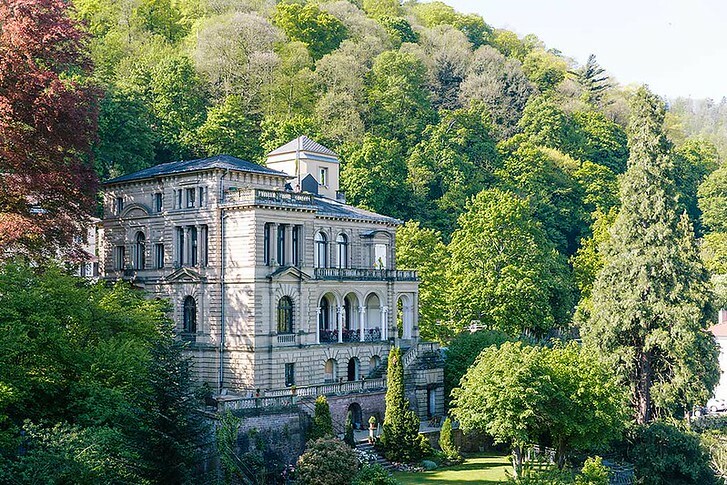 If you are interested because you want a good local dinner, we heard rave reviews from the people on board who did the Schloss Johannisberg castle dinner + wine tasting, the next night in Koblenz. If you do choose that, just to let you know, the fun ‘local dinner’ night that Viking does is on the same evening. So whatever you chose, it will be a memorable dinner! On board they decorate it like a mini Oktoberfest, with music and local cuisine, beer, pretzels, schnitzel etc. It was loads of fun, but only half the people were on board (other half chose between the optional dinners and they came back very happy too). Hope that helps – have a great trip! We just booked this cruise for April 2020. What a wonderful blog. Thank you so much. I will be checking back and taking notes!! We have booked the cruise from Basel to Amsterdam for late September, our 50th anniversary. We did Avignon to Lyons last year on Viking and loved it! Your descriptions of life on ship are spot on. We are seniors and I have a knee problem (May have surgery soon, took the insurance) and found the “leisure” walking groups doable. Did not ascend the Popes’ Palace but admired from below. Question: Recommendations for hotels in Amsterdam? Fantastic blog. Thank you. 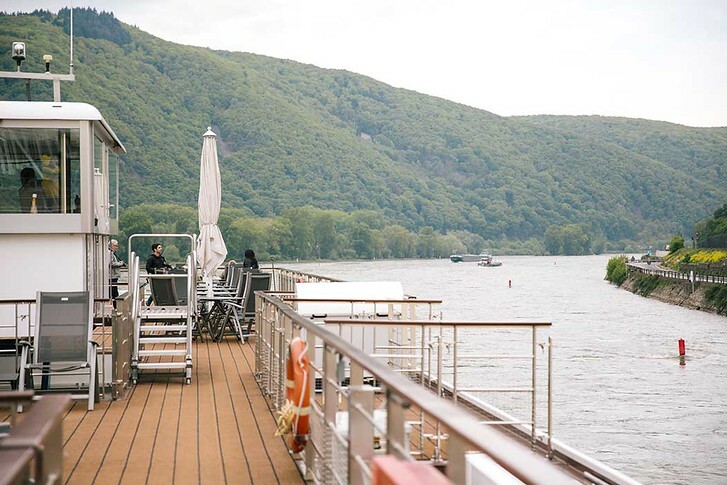 We are going on the Rhine Getaway (our first river cruise) very shortly–love your review! My question: should we get “the local money” euro or do most of the shops take American credit cards? Thanks. Hi Linda, ooh fun! Have a great trip! Hm, for the most part the cruise is “all inclusive” so you would only need cash for souvenirs and any meals you wanted to take on your own. Most restaurants and stores will take American credit cards with chips but to be safe, you can take some euro out. Ask your bank if they will change for you? Ours offers it without fees. We have been on Viking a few times. You really did them well with your descriptions. They are a great company and we feel they really treat you well.I would love to do a cruise like you did and write about everything. I have suggested it to them and haven’t heard back. I would love to rate their ocean ships, especially northern Norway.